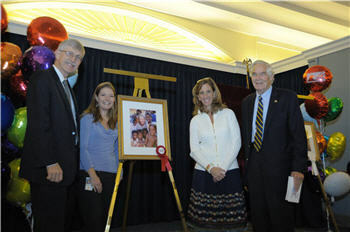 The National Library of Medicine has had the honor of leading the 2011 NIH Combined Federal Campaign (CFC). NIH staffers have been so generous they exceeded the $2.4 million goal before the end of the donation period. The total at this writing is more than $2.6 million. Donations are being accepted through February 15, 2012. In the months after the kickoff, there were several other events to raise awareness and contributions, including a new activity, an online photo contest. The NIH IC Directors’ Challenge Photo Contest, Picture of Giving, encouraged NIH institutes and centers to submit pictures of giving. The photos were posted online and judged by thousands of NIH employees. First prize went to an entry called Combating HIV/AIDS in Peru submitted by Fogarty International Center. The photographer was David Snyder. The task of leading the NIH CFC rotates every year among NIH’s institutes and centers. NLM happened to have its turn during a double anniversary year. 2011 marked the Library’s 175th anniversary and the 50th anniversary of the Combined Federal Campaign. President John F. Kennedy established the effort to help people in local communities across the country. 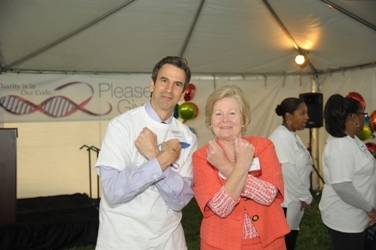 The NIH campaign is part of the CFC of the National Capital Area (CFCNCA). The 2011 CFCNCA Catalog of Caring lists more than 4,000 charities and has a goal of raising $67.2 from federal workers in the District, Maryland and Virginia metro area. (Top Photo) With the theme of Charity is in our Code, the crossed arms gesture was adopted to demonstrate DNA’s double helix structure (the gesture is also known as “love” in sign language). Getting into the spirit here are Todd Danielson, NLM Associate Director for Administrative Management, and Ann Mitchell, President and CEO of Montgomery Hospice, representing the CFC charities. Photo by Michael Spencer. (Middle Photo) Picture of Giving 1st place honors went to Combating HIV/AIDS in Peru. Photo by David Snyder. (Bottom Photo) 2nd place honors went to the Clinical Center’s entry Habitat Volunteers, shown with NIH Director Dr. Francis Collins, photographer Charlotte Goethals, CC Chief Operating Officer Maureen Gormley and NLM Director Dr. Donald Lindberg. Photo by Bill Branson.